In today’s mobile and collaborative world, securing the network perimeter is no longer adequate by itself. Organizations need an approach to document security that controls access to documents on any device, while securing their most sensitive documents. 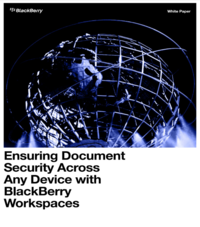 Download this white paper and learn how by taking a file-centric approach, BlackBerry Workspaces provides a balance between user productivity and security requirements in an intuitive way, usable anywhere on any device.